VILLA ARIADNE is a three-storey villa, tastefully furnished in a contemporary style, and situated around 30 minutes from Sorrento. 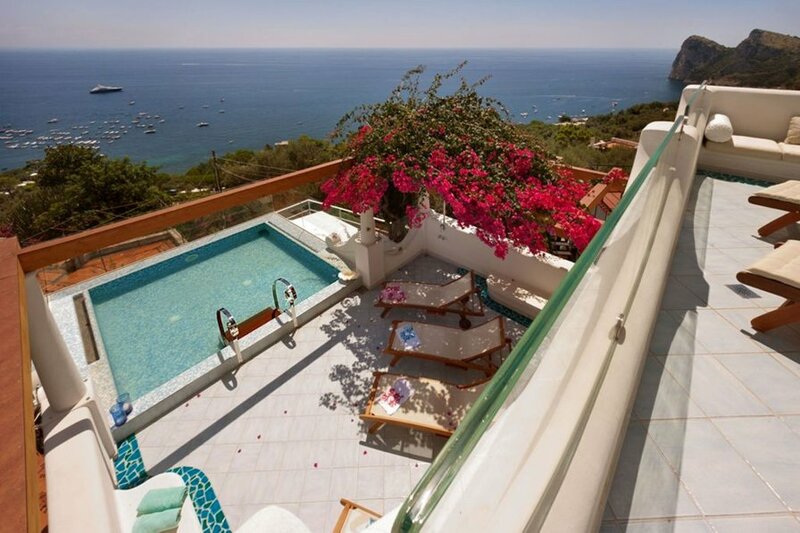 From the villa you will enjoy a dazzling view of the sea. Villa Ariadne is around 400 square meters in size and has a private swimming pool, Jacuzzi pool, private indoor Jacuzzi, private panoramic terrace with sea view, air conditioning, heating, parking, and Wi-Fi internet. Villa Ariadne is located a short distance from Cantone beach at Nerano, an old seafaring village which today is a renowned tourist hub with a small centre surrounded by villas, hotels, and some of the best Michelin-starred restaurants on the peninsula. Villa Ariadne is a piece of paradise embedded in the Amalfi Coast, loved for its underwater caves, crystal sea, local hospitality, and the green of the surrounding coast. You’ll be about 10 minutes walking distance from both the beach and the best restaurants in the area. The closest supermarket is about 1 km away, and the SITA bus stop (services between Nerano and Sorrento) is about 500 m away. In less than 30 minutes by car you can get to Sorrento, Positano, or Amalfi. You won’t need a car to stay at Villa Ariadne, but if you do come by car you’ll be able to park for free inside the gate. The parking area is big enough for two vehicles. You then reach the villa from the parking area by climbing up six steps. The classic combination of blue and white Mediterranean colours dominates the large bright interior of Villa Ariadne, whilst the bespoke furniture creates an eclectic, yet warm and romantic style. The spacious and bright interior is ideal for enjoying your free time relaxing with your family or with a group of friends. THE SWIMMING POOL is 5 metres wide, 10 metres long, and 1.2 metres deep, and is available from April to the end of October. The pool area is equipped with loungers, deck chairs, and an outdoor shower. Adjacent there is an outdoor covered lounge complete with kitchen, barbecue, fridge, and a dining table for 12 people. You get to the pool from the first floor of the villa. THE FIRST TERRACE is equipped with small tables and chairs, a porch swing, and a hammock. The terrace is partially covered by a pergola. Access to the terrace is from the living room. THE RELAXATION AREA is fitted with a 5-person Jacuzzi, chairs, TV, air conditioning, and Wi-Fi internet. Access to the room is from the first terrace. THE LIVING ROOM contains a chimney surrounded by many sofas and chairs, a glass coffee table perfect for snacks or games, satellite TV, home theatre system, and iPod. The dining room, which opens onto the first terrace, has a view of the sea and has space for fourteen people. The room is fitted with air conditioning and heating. THE PROFESSIONAL KITCHEN is fitted with a four-burner gas stove, an electric oven, fridge-freezer, dishwasher, microwave oven, moka pot, americano coffee machine, toaster, and other small appliances. From the kitchen you will have access to the patio. The kitchen has a window with a panoramic view of the garden. Access to the kitchen is from the living room. THE SMALL BATHROOM contains a sink and toilet. Here you will also find a washing machine, dryer, iron, and ironing board. Access to the bathroom is from the living room. THE FIRST BEDROOM WITH EN SUITE BATHROOM contains a double bed, two chairs, a desk, satellite TV, a minibar, air conditioning, and heating. The room has a window which overlooks the garden. The bathroom is fitted with a sink, hydromassage bathtub, toilet, bidet, and hairdryer. Access to the bedroom is from the corridor. THE SECOND BEDROOM WITH EN SUITE BATHROOM contains a double bed, a desk, satellite TV, a minibar, air conditioning, and heating. The room has a window which overlooks the garden. The bathroom is fitted with a sink, shower, toilet, bidet, and hairdryer. Access to the bedroom is from the corridor. THE THIRD BEDROOM WITH EN SUITE BATHROOM contains a double bed, a desk, satellite TV, a minibar, air conditioning, and heating. The room has two windows with a partial view of the sea. The bathroom is fitted with a sink, shower, toilet, bidet, and hairdryer. Access to the bedroom is from the corridor. THE FOURTH BEDROOM WITH EN SUITE BATHROOM contains a double bed, a small sofa, two chairs, a desk, satellite TV, air conditioning, and heating. The bedroom also has a private terrace with a beautiful view of the sea. The bathroom is fitted with a sink, shower, toilet, bidet, and hairdryer. Access to the bedroom is from the corridor. THE FIFTH BEDROOM WITH EN SUITE BATHROOM contains a double bed, a desk, satellite TV, air conditioning, and heating. The room also has a window with a view of the garden. The bathroom is fitted with a sink, shower, toilet, bidet, and hairdryer. Access to the bedroom is from the corridor. - For arrivals after 8:00 PM will be applied an extra cost of 60,00 euro to be paid at the arrival.